As the second largest city in Portugal after Lisbon, Porto is beautiful and it boasts of a fascinating history and a vibrant nightlife. 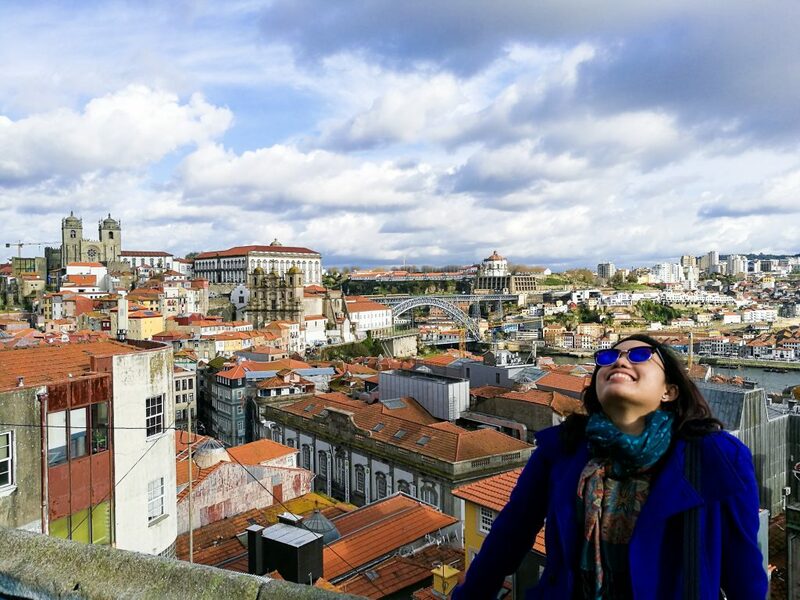 With its many attractions, it’s easy to fall in love with Porto. Most travelers seem to agree as it was elected the Best European Destination by the Best European Destinations Agency in 2014 and again in 2017. In 1996, UNESCO recognized Porto’s historic centre as a World Heritage Site. The Ribeira district is the oldest district and its narrow cobbled streets are filled old houses, small restaurants, bars and cafes and numerous baroque churches. 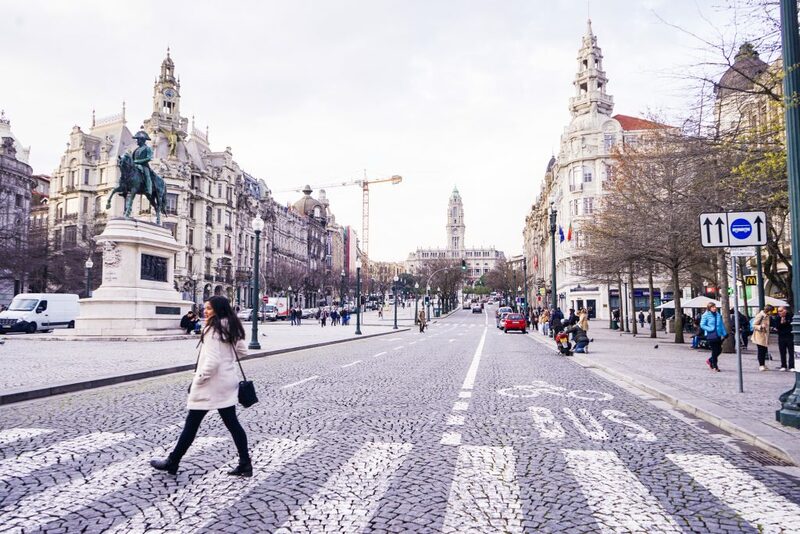 One of the best ways to enjoy Porto is by walking. Free maps are available from tourist offices and it is easy to navigate on foot. We stayed in Porto Vintage Guesthouse which is located right in the heart of the city. Perfect for all our explorations. One of the things you’ll notice is that there seems to be a church on every corner of the city. The quaint baroque Clerigos Church and Tower is located on Rue de Sao Filipe de Nery, near the Praca de Liberdade. 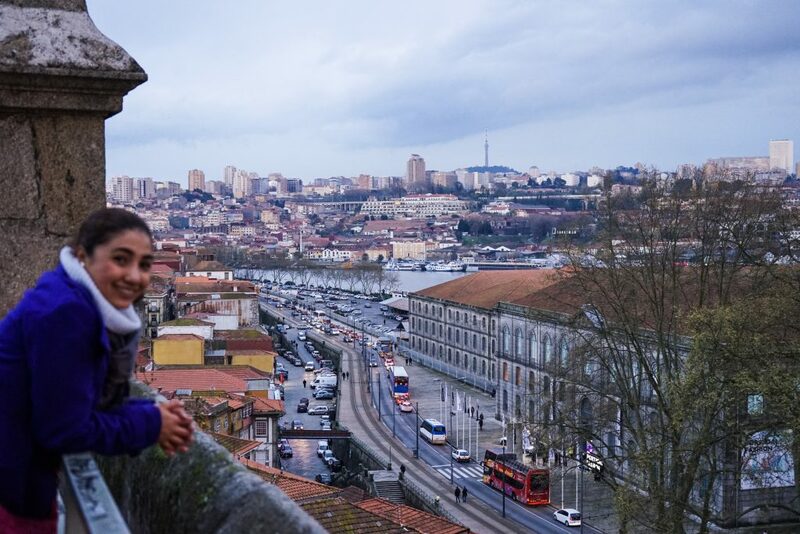 Found on the highest point of the old city, you can choose to climb up the tower to see a 360 degree panoramic view of Porto and Vila Nova de Gaia. Built in 1830 as the city’s stock exchange, the structure features a Neoclassical style and is filled with ornately decorated rooms. A visit includes a mandatory guided tour. We were a little tour-ed out so we opted to take photos from the outside instead. This train station is considered one of the most decorative stations in Europe. 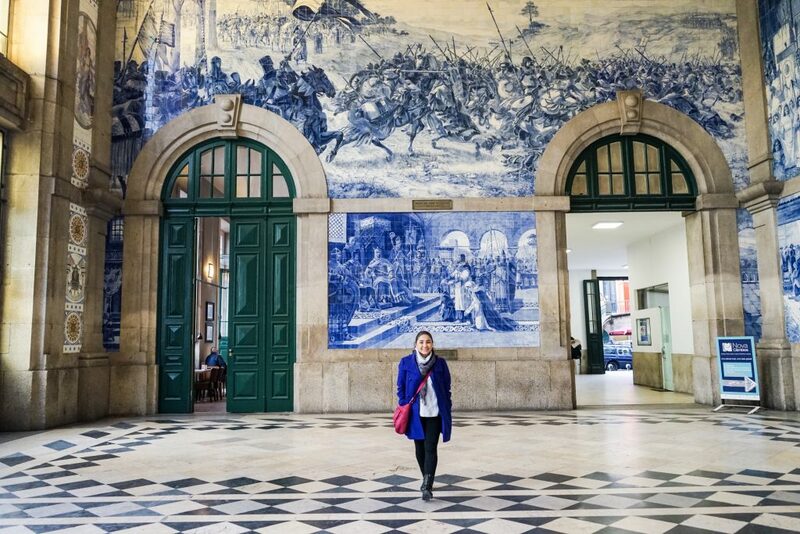 Its walls are adorned with azulejos tiles that depict important events from Portugal’s history. Nearby, you’ll find that these azulejos tiles also cover the exterior of the Saint Ildefonso church. 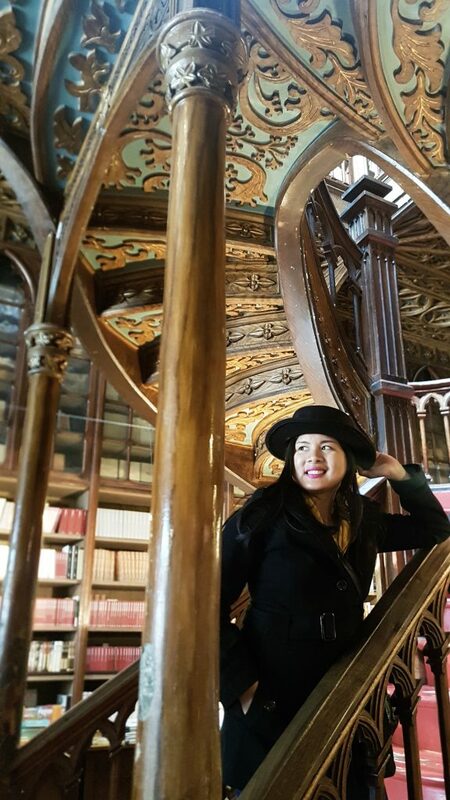 Found along Rua das Carmelitas, Livraria Lello was built by brothers Jose and Antonio Lello, who were men of letters and lovers of literature, books and music. Howeve, it is now popularly known as a must-see for any Harry Potter fan. After all, JK Rowling had lived in Porto and this bookshop is said to have inspired the twisting grand staircase in Hogwarts. The building has a neo-Gothic design, Art Deco details on the walls and a stained glass skylight that lights up the shop. There is a 4 euro entrance fee that can be used against a book purchase. Take note that a lot of tourists come to take photos here so it will take a lot of patience and great timing to get the shot you want. The city is absolutely picturesque and for most travelers, the challenge lies in finding where you can get your perfect shot. There are numerous viewpoints you can choose from: Clerigos Tower, Se Cathedral, Igreja e Colegio de Sao Lourenco, Jardines do Palacio de Cristal and Miradouro das Virtudes. We went to Miradouro da Vitoria, which is in the middle of the Old Jewish neighborhood. 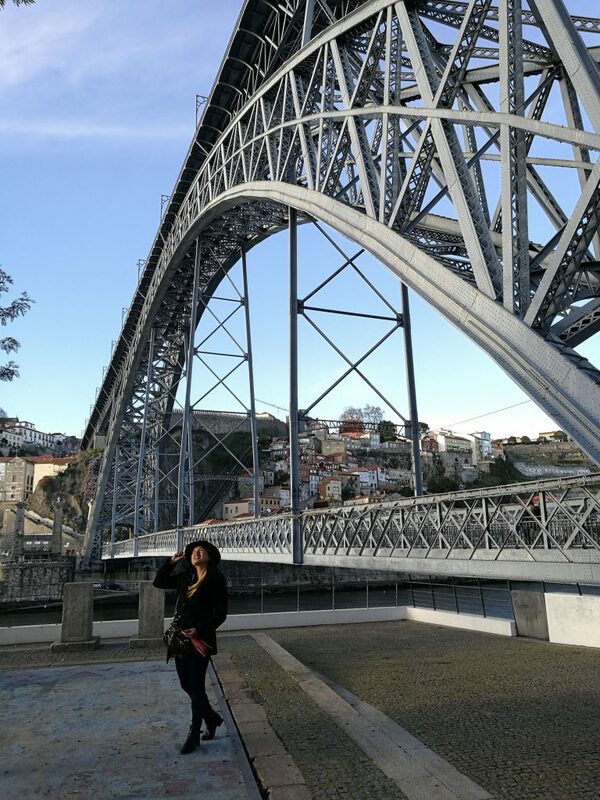 It offers an exceptional view where you can see Vila de Gaia, the convent, the Dom Luis I bridge, the Se Cathedral and even the glass dome of the Palacio da Bolsa. 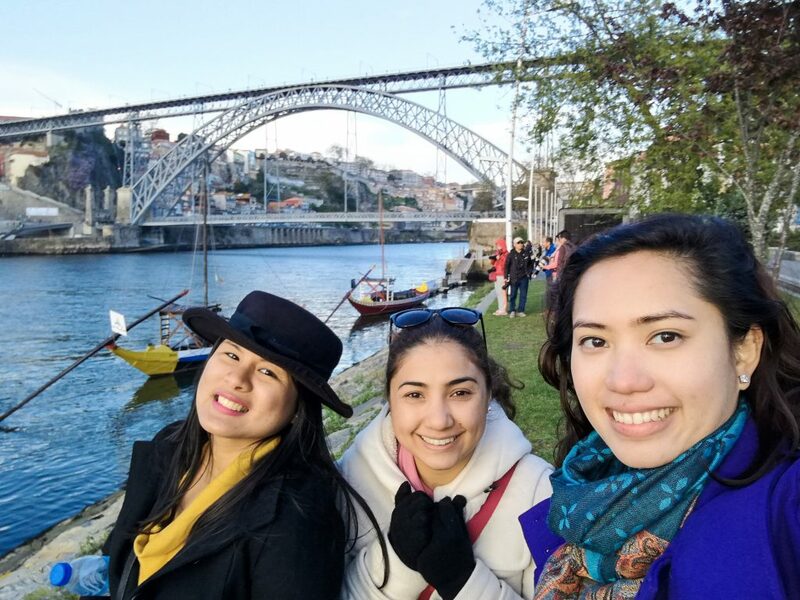 From the Ribeira District, walk across the Ponte Luis I Bridge that connects Porto to Vila Nova de Gaia. The iron bridge features an upper and lower deck that is supported by a central arch. While we opted to cross via the lower deck, most tourists cross the top deck because it is reserved for pedestrians and one of the city’s metro lines. For the weary traveler, you can also choose to take the Six Bridges cruises that leave from the Ribiera riverfront. You can choose to take modern cruise boats or any of the smaller traditional flat-bottomed boats, called rabelos. 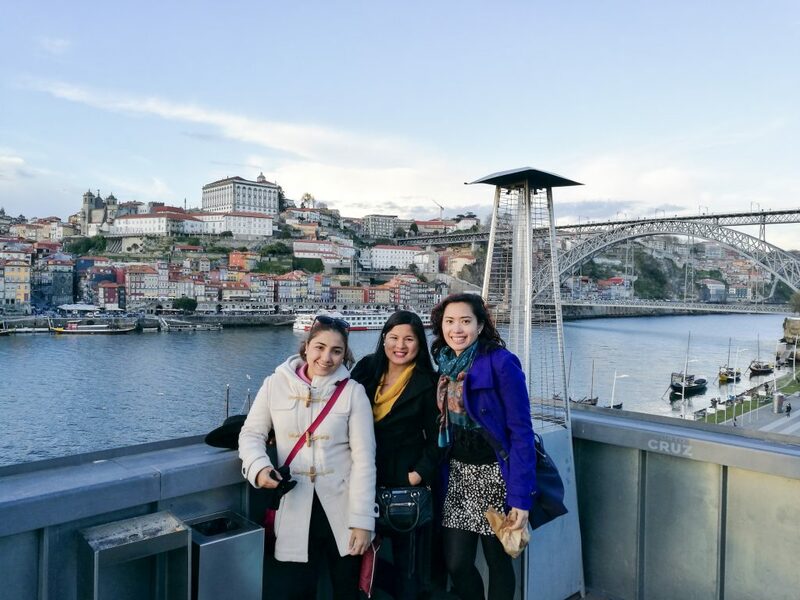 These cruises typically take an hour as it floats up and down the Douro River (river of gold) and gives you a fine glimpse of all of Porto’s bridges, including the Ponte Dona Maria Pia that was designed by Gustav Eiffel—the architect of the famous French tower. Another way to view the city is by aerial gondola. The Teleferico de Gaia at the south of the River Douro begins at the station close to the Serra do Pilar convent church and Jardim do Morro stop of the Porto metro and runs to the station on Avenida Ramos Pinto on the river front. There are 12 gondola cabins that fit 8 passengers and the total journey time is about 5 minutes. 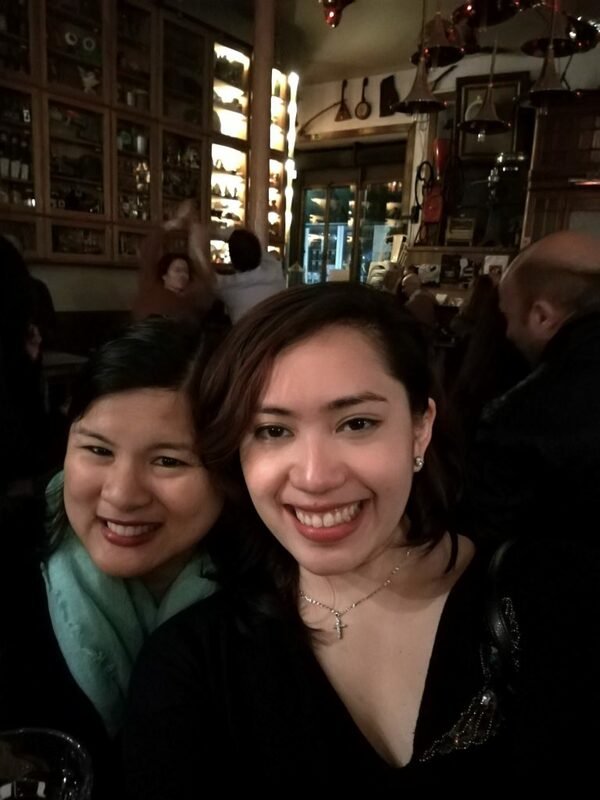 We headed over to Rua da Galeria de Paris and found a bar named after the street. It is decorated with vintage toys and memorabilia and serves cocktails and beers. On some nights, they push the tables and chairs aside and have Brazilian dancing. 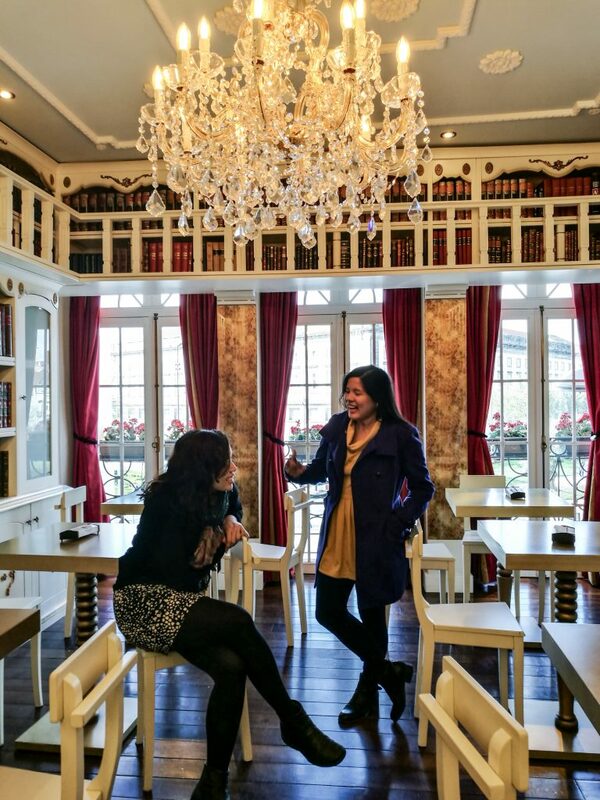 Other popular spots are Casa do Livro and MoreClub Porto. One of the first things you notice when you’re an Asian in Porto is that servings are really big. If you want value for money, try asking for the menu of the day. It typically includes a soup or salad, a main course and a dessert or drink. We had a late lunch at a Mediterranean restaurant called Grigio. Their menu of the day included soup, a pizza that could feed three people or a pasta, and a tall glass of lemonade. The Ribeira district has a lot of great restaurants. But if you’re there on a weekend, make reservations! We had dinner at Jimao Tapas e Vinhos, a small and chic restaurant near the river. They’re very knowledgeable about wine so feel free to ask your server for recommendations. Just remember that many restaurants serve olives and bread and charge you for them automatically, so refuse if you don’t want them. We had the duck confit (Confit de pato), and the squid ink pasta and the tenderloin and they were all delicious, well- executed dishes. This Portuguese sandwich translates to Little Frenchie or Frenchie in English. It can be found in most restaurants and cafes but in our case, we tried it at Luso Caffe. The café is a bit pricey but it does have great ambiance, attentive wait staff and an extensive menu. The Francesina is made with bread, wet-cured ham, linguica (fresh sausauge) and roasted meats. Then it’s drechned in melted cheese and hot thick tomato and beer sauce and is served with French fries. In some cases, it can be topped with a sunny-side up egg so you slice through it and watch the yolk ooze all over the sandwich. It is a drunk person’s dream sandwich. In our case, we ordered one and shared it among three girls and that kept us full for the rest of the afternoon. We encountered this building as we were walking past the Clerigos Tower. Curious, we headed inside and found that it was a place devoted to codfish cake. 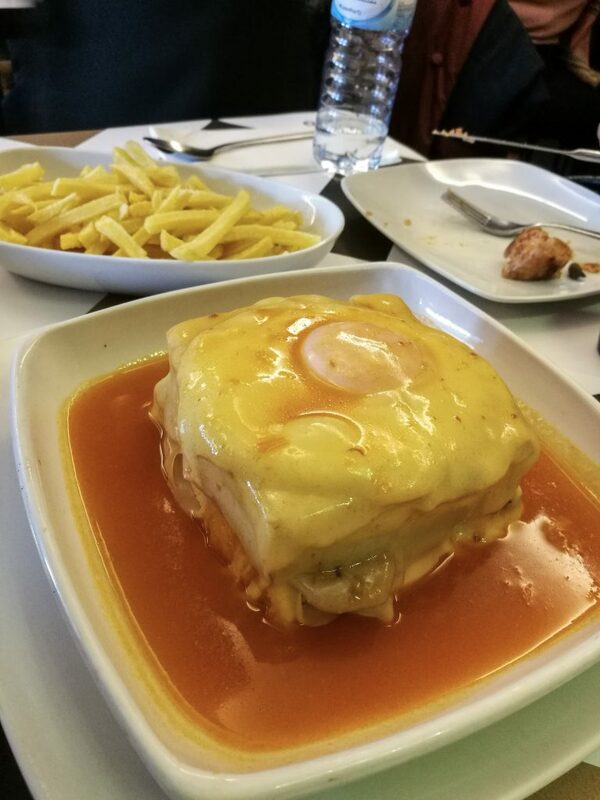 We knew that the Portuguese like their codfish and in this case, they added serra da estrela cheese just to take it over the top. 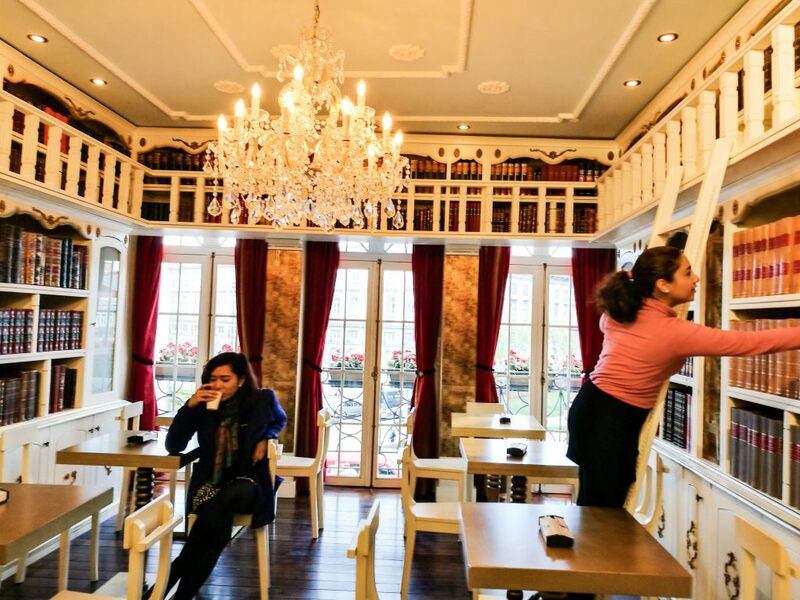 The building also houses a small library so you can munch on your codfish cake or have a cup of coffee surrounded by books. One of Portugal’s most famous exports is Port wine. And if you are coming to Porto, you must try a bottle. Or four. 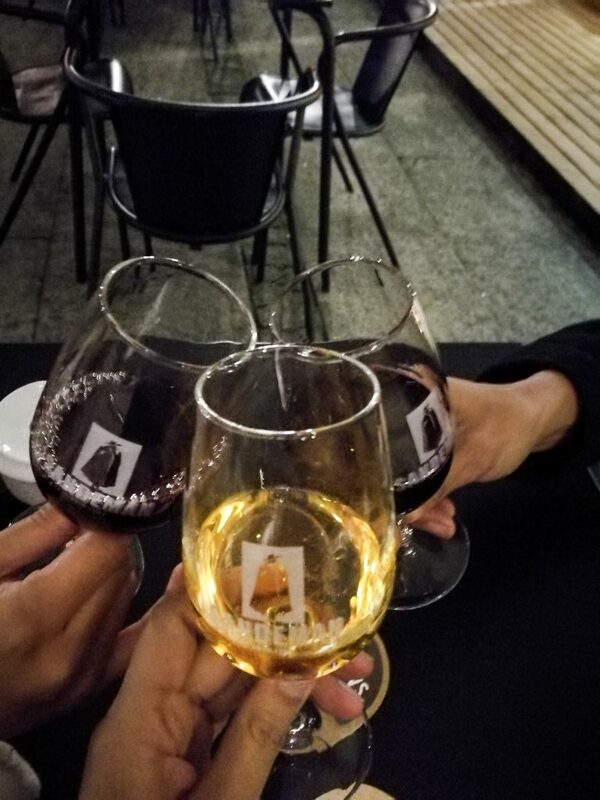 But kidding aside, if you are a wine lover, you must cross the bridge and head to the traditional home of Port – the city of Vila Nova de Gaia. There are numerous lodges that offer tours and tastings where travelers can simply show up and ask for a tour. Tours can be conducted in multiple languages so it is best to check schedules when you arrive in the city. 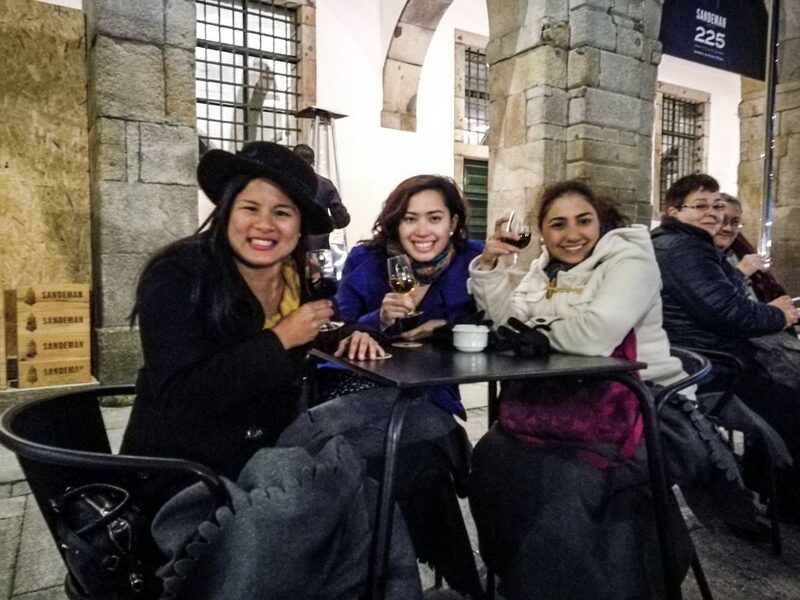 Food and wine tasting tours by one of the many operators in the city such as Douro Exclusive, Porto Walkers (this is free! 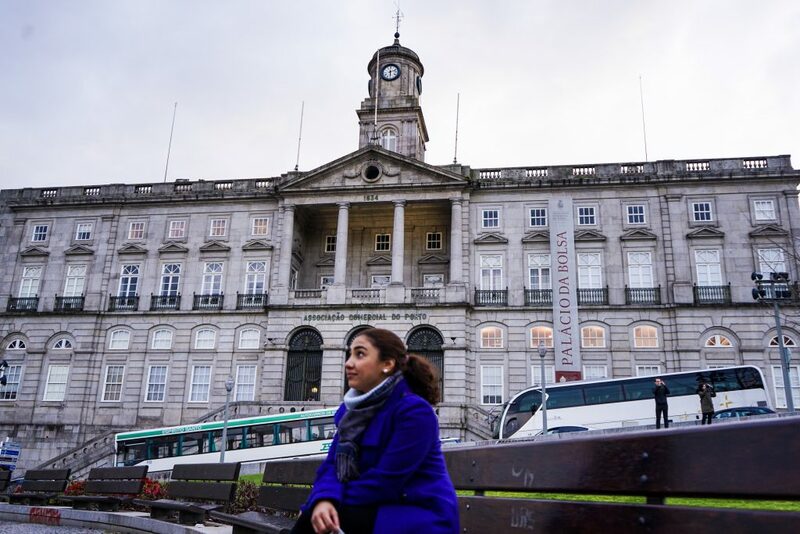 ), Taste of Porto Food and Wine Tours, or Cooltour Oporto (Douro valley tour) also offer great options for anyone that wants a guided tour of the city and a chance to taste the best of what Porto has to offer. Sandeman Porto Cellars is a great stop for novices. And if you like rooftop bars, the Porto Cruz 360 Terrace Lounge is a great choice if you’re looking to enjoy your port wine while watching the sunset over Porto. 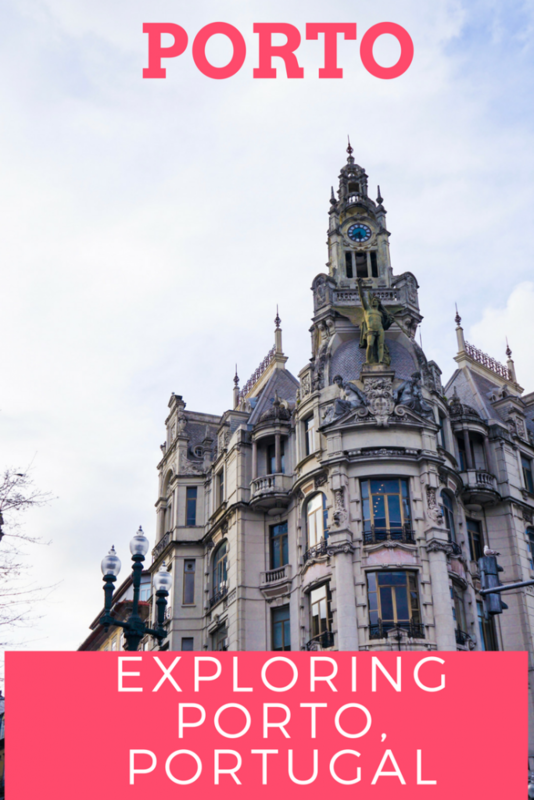 Wine in Porto is inexpensive compared to Spain, so take advantage! Try the different kinds of Port to find your favorite and don’t hesitate to bring a bottle home for yourself or your loved ones. Taxis in Porto are not that cheap, you pay 2,5 euros once you get inside. There’s also an extra fee for carrying bigger types of luggage, roughly 1,80 euros per piece. All licensed taxis must have a visible taximeter display that shows the amount being charged and you are issued a receipt at the end of the ride. You can also use Uber , the rate is about the same and you enjoy the convenience of ordering a taxi when you need it and having an estimate of how much it is going to cost. I loved your post! 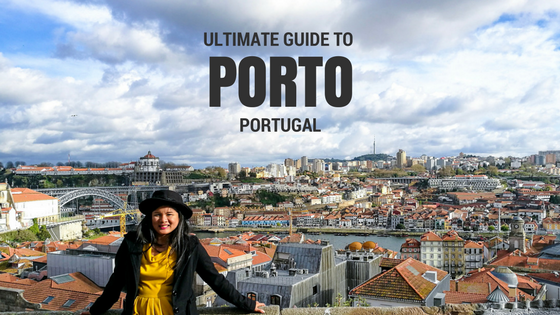 I have always wanted to go to Porto and your guide is so detailed and helpful! I loved your pictures too! Wonderful! 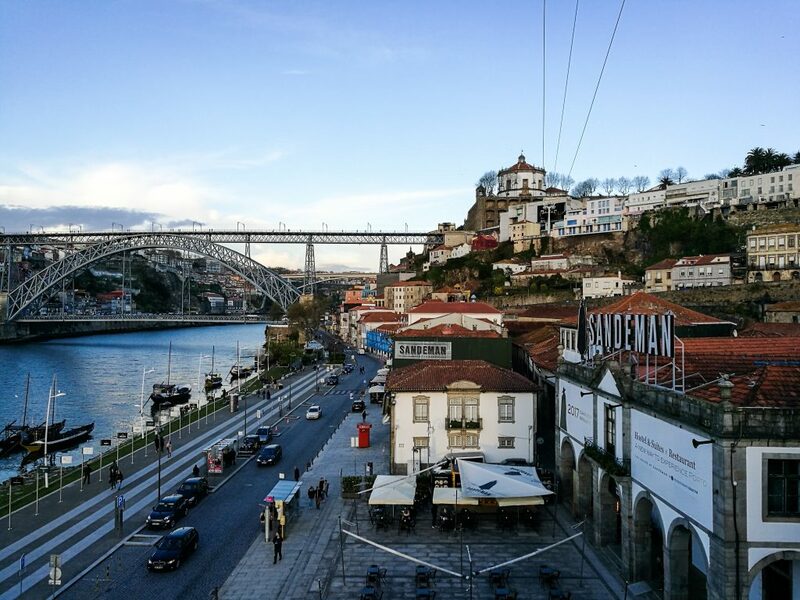 I spent a few days in Porto last autumn and absolutely adored it. This city is just so beautiful, I loved the amazing architecture, I loved the azulejo (tiles) adorning so much of the city, I loved the food and drink, and the whole vibe of the place. I wrote a long post about the city too and yours has really got me reliving my trip and yearning to go back! We were out of time by the time we got to Porto and had to drive straight through. It looks like an interesting city, and that train station is really lovely. We visited Porto last year and absolutely loved it. I agree – walking is the best way to explore this great city. But – wait! – how in the world did I miss that bookstore??? Now I have to go back! You really have to, it’s one of the top bookstores always listed. It was really pretty inside. 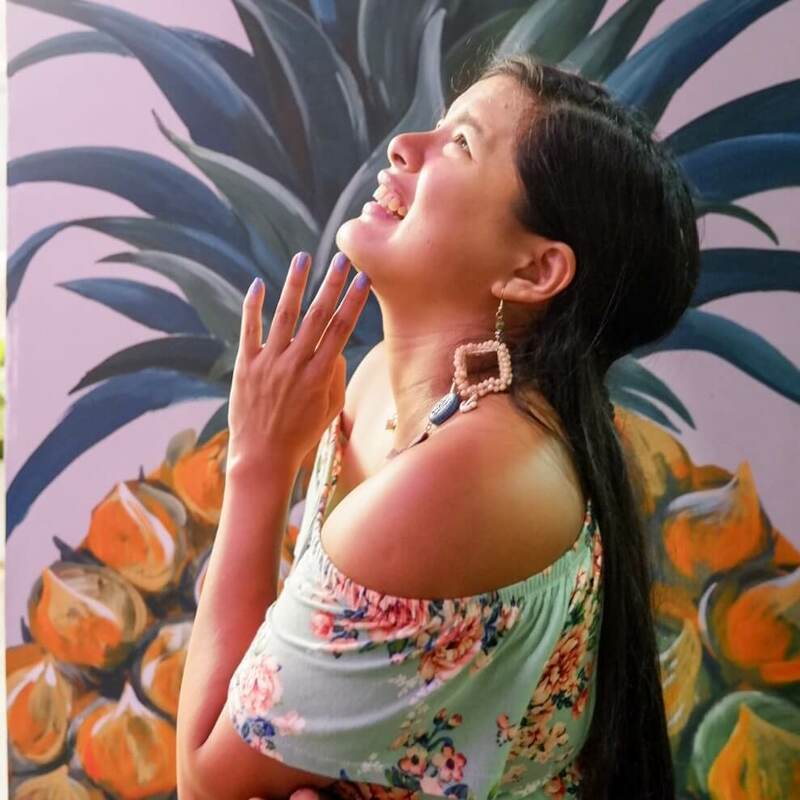 Great post, Karla! We visited Porto within a day in 2002, and that was a loooong time ago. 😀 Last year, we spent a blissful week in Lisbon, and totally loved it. We’re now planning to explore Porto next year, and you’ve mentionned quite many things that we’d want to do and see. I’m pinning this for our upcoming trip! Thank you for sharing this! 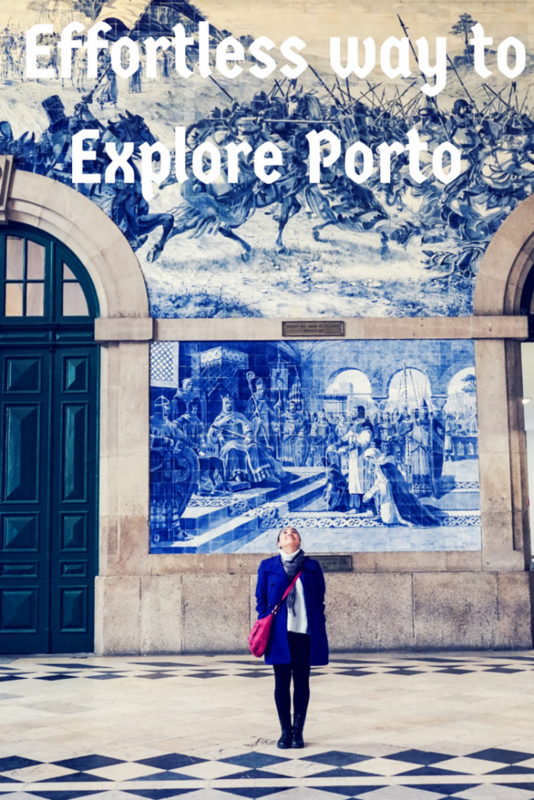 I can’t wait to get to Porto – Portgual seem to be a really up and coming destination, one which is starting to get really trendy. I LOVE that the historic centre is a designated World Heritage Site – definitely up for some walking to explore! This post has brought back wonderful memories of our trip to Porto a couple of years ago. I agree, walking is the best way to see the city and we enjoyed doing a free walking tour. Sao Bento Train Station is so pretty and I remember studying the tiles for ages! Casa Portuguesa do Pastel de Bacalhau looks so opulent – I can’t believe it’s dedicated to codfish cake! 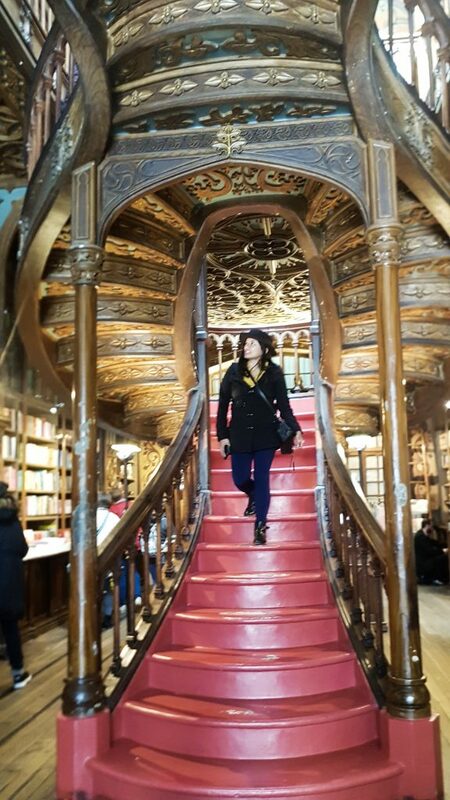 As a HP fan and lover of ornate staircases, I would love to visit Lello Bookshop next time we go! Thanks for the inspiration and the memories! Porto comes across so charmingly in your pictures. I really fancy walking around the beautiful streets taking in the sights. The city still retains an old world charm that is so alluring. There is so much to see and experience there. Hope to get there someday.